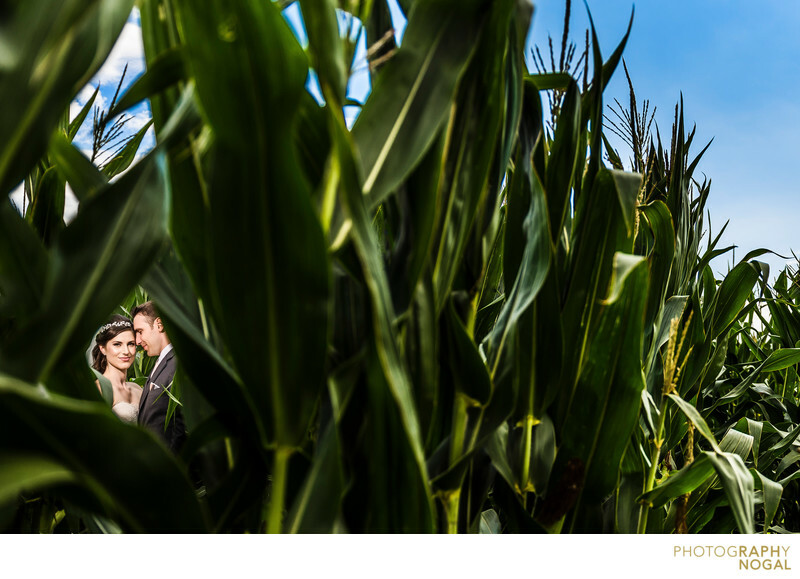 I took this photo of the bride and groom among the cornfields at the Fields on West Lake in Bloomfield, Ontario. The vibrant setting and clear day called for a colourful image. This was achieved by positioning the couple within the tall corn stalks, appearing between a small gap, so that the rich greens and blues could stand out. This photo was taken with a Nikon D750 DSLR at ISO 1600, f2.8 aperture, 1/2500th shutter speed with a Nikon Nikkor 24-70mm f2.8 zoom lens, at 24mm focal length. The lighting was a Profoto B1 OCF flash with Magnum Reflector to help mimic the hard sun light. The B1 was placed to the left of the camera and created a beautiful light to help illuminate the bride and groom.